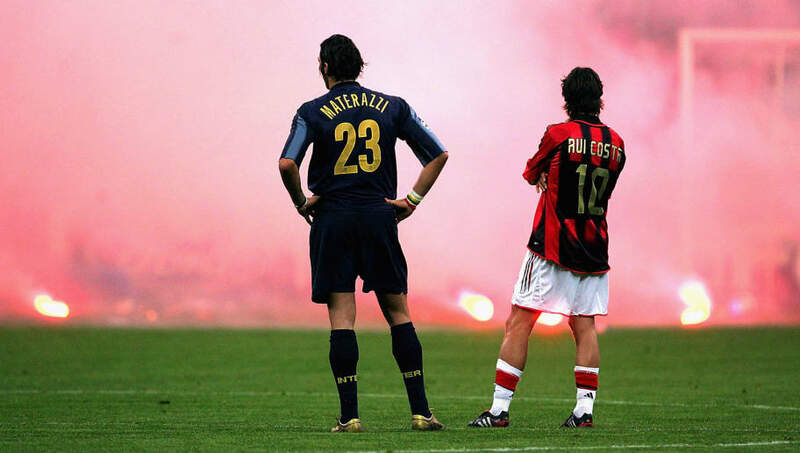 Inter vs Milan is one of the most iconic derbies in world football. The intense cross-city rivalry, passion, history and spectacular San Siro setting sets the encounter up to be an unmissable showdown year after year. The two sides' desire to dominate the Lombardy region means nothing short of blood, sweat and tears are left on the pitch, as the 22 give it their utmost to battle it out to claim the victory and, of course, the local bragging rights. Saturday night's fixture promises to be a tense, engaging and dramatic affair, in the meantime here are six classic clashes between the old rivals. The two sides had met only twice previously in the UEFA Champions League before their quarter-final second-leg of 2005. 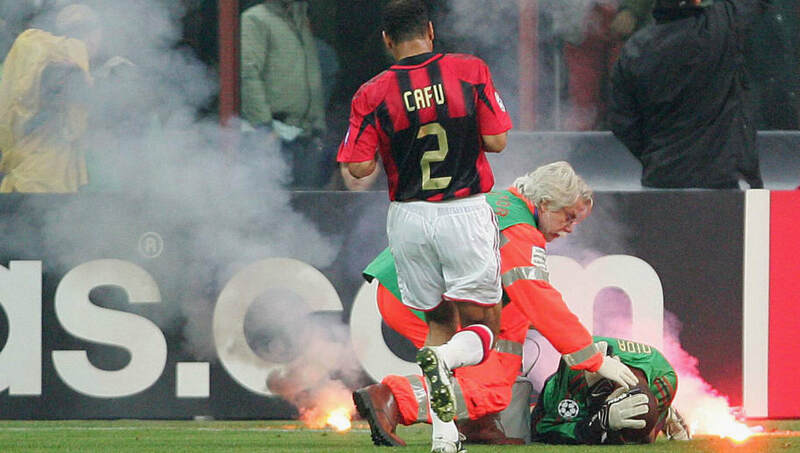 Milan had led 2-0 from the first-leg and Andriy Shevchenko's 30th minute strike on the night had given them a 3-0 aggregate lead, to all but send them into the last-four. However in the 72nd minute, the match was abandoned after keeper Dida was struck by a flare from the stand - demonstrating just how intense and passionate the supporters can get in these fixtures. As a result, Milan were awarded a 3-0 win via a forfeit and as a result won the tie 5-0 on aggregate. They went onto reach the final, where they were beaten by Liverpool on penalties. Milan had won four of the previous five derbies in all competitions going into the match, but it was Inter who would final come out on top in this classic encounter. Hernán Crespo headed home from a set piece to open the scoring, before Dejan Stanković drilled the ball into top corner from outside the area to double the lead. Zlatan Ibrahimović then squeezed the ball home past Dida, shortly after the interval, for Inter's third, but Clarence Seedorf pulled a goal back for the Rossoneri to give Milan hope. Marco Materazzi added a fourth for Inter before further goals from Alberto Gilardino and Kaka reduced the deficit for Il Diavolo, however I Nerazzurri were able to hold for the win. Diego Milito opened the scoring of the six-goal thriller for Inter in the 14th minute, but two strikes in quick succession either side of the break from Zlatan Ibrahimović, against his former side, ensured Milan had the lead. Milito then netted twice from the penalty-spot to complete his hat-trick, turning the game on its head and putting the Nerazzurri in front, before Maicon added a fourth late on to seal the victory. This encounter was then-head coach Stefano Pioli's first Milan derby in charge of Inter. His side were dominant early on and created several good opportunities, but fell behind three minutes before the interval, when Suso cut inside to curl home into the bottom corner - against the run of play. Seven minutes after restart, Il Biscione levelled the scores through Antonio Candreva, who rifled the ball past Gianluigi Donnarumma. Pioli's side were barely level for six minutes, however, as Suso added his second of the match to regain Milan's lead, but in the 92nd minute, Ivan Perišić tapped in from close range, to salvage a well earned point. The encounter for Milan, was their first since the unveiling of their new Chinese chairman Yonghong Li, who was appointed as Silvio Berlusconi's successor. His new side didn't get off to the best of starts however, as the Rossoneri conceded twice in an eight minute spell, following strikes from Antonio Candreva and Inter skipper Mauro Icardi, who tapped in just before half time to give Il Biscione a two goal cushion. In the 83rd minute, Il Diavolo pulled a goal back when Alessio Romagnoli poked home via deflection, following a corner. The goal looked to have given the side hope and deep into injury time, they drew level when another set piece proved to be the undoing of the Inter defence. The delivery was flicked on by Carlos Bacca and into the path of Cristián Zapata, who fired home the loose ball off the underside of the bar. Inter required a victory to close the gap on then-leaders Napoli, and they got off to the perfect start when skipper Mauro Icardi latched onto Antonio Candreva's cross to guide the ball home for La Beneamata. 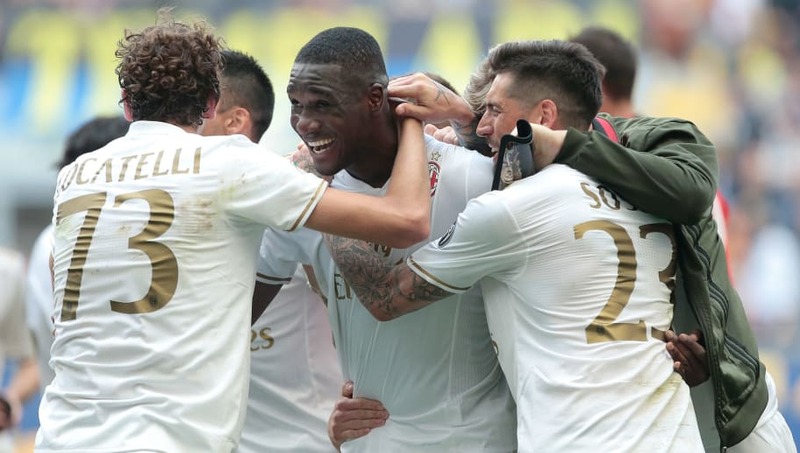 Milan improved considerably during the second half and drew level through a trademark Suso goal in the 56th minute, cutting inside to curl home past Samir Handanović. 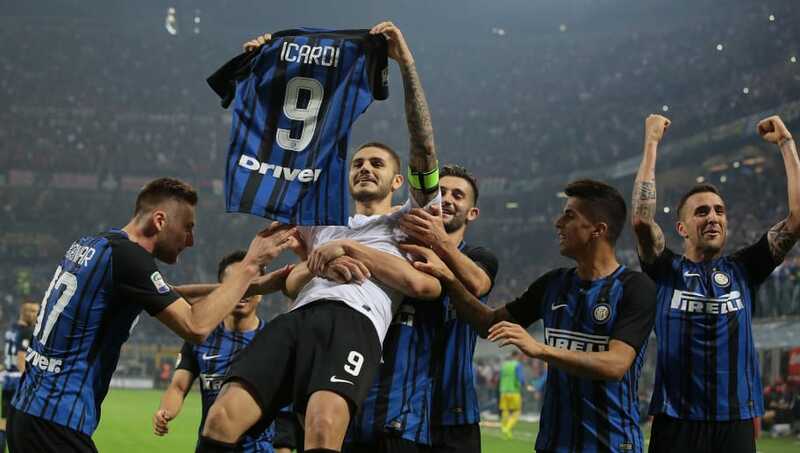 However the Rossoneri were level for barely seven minutes, as Icardi met Ivan Perišić's cross to volley home and regain the lead for the Nerazzurri. The match took another twist when Giacomo Bonaventura's strike from a Fabio Borini cross ricocheted in off Handanović, via the post. The game was heading towards a stalemate until Il Biscione were awarded a controversial penalty in the 90th minute, when Ricardo Rodríguez was penalised for a foul on Danilo D'Ambrosio, following a corner. Icardi stepped up to send Gianluigi Donnarumma the wrong way and find the net, completing his hat-trick and sealing a 3-2 victory.